Well, the party last weekend went off without a hitch! Except for the fact that we had to move what was supposed to be a backyard movie party inside due to cold temperatures. Still, we had a blast! 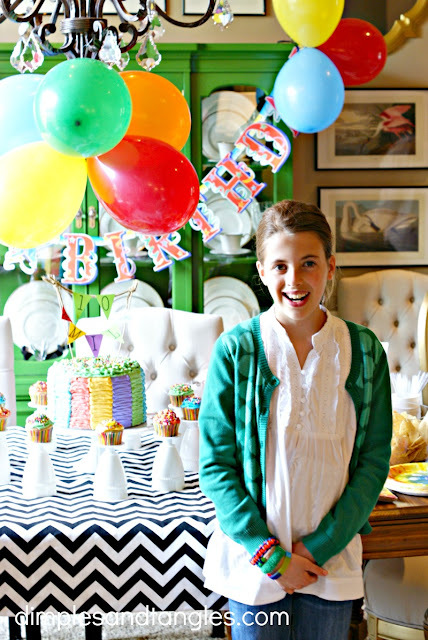 Emily turned 10 over the weekend and although we usually have big family parties, this time she invited a few friends to come. 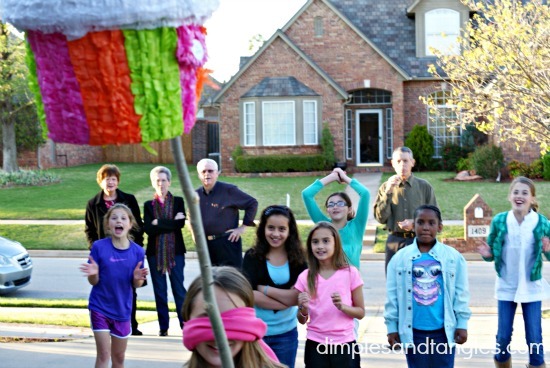 The festivities started with a piñata...attached to the basketball goal. At some point it ended up on the ground and everyone had a turn to whack it until it burst! Keeping with my "use what you have" motto, I think birthday parties can be fun and meaningful without spending a lot, hours and hours of preparation, matching everything, and a magazine-worthy picture perfect table. I used a generic "HB" banner from $ Tree, plates, napkins, favors and suckers from Wal-Mart, blew up balloons, and borrowed the adorable tassel garland from my sister. I also got some colorful gift sacks from Hobby Lobby, cut the tops shorter, and used them for the popcorn bags. 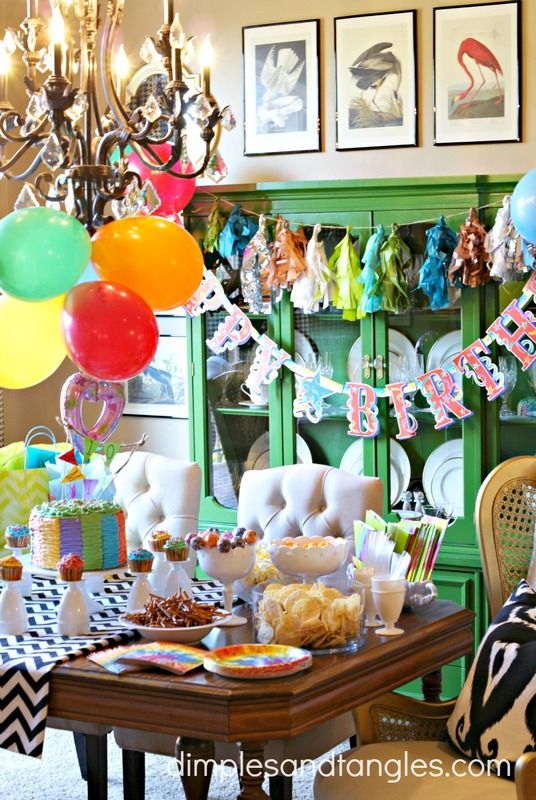 With the party moving inside, we clamped a canvas dropcloth up to the curtain rod and pushed all of the furniture to the back of the room, leaving room for the girls to relax on the floor and watch the movie. With a borrowed projector we enjoyed "The Chronicles of Narnia-Voyage of the Dawn Treader." During intermission we opened presents and had cake and ice cream. 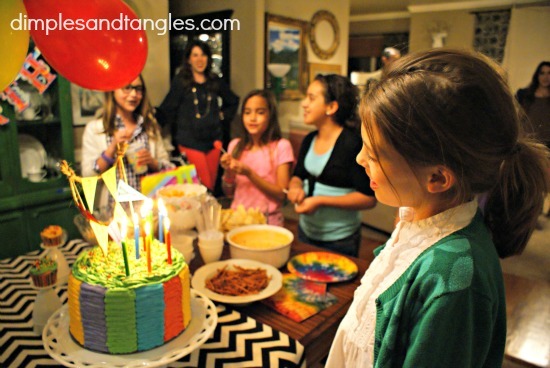 I love the expression on her face as she looks at the cake! If you're a friend on Instagram (you can follow me here), you were in on all of the action of creating the cake. I'll fill you in on the cake tomorrow...and the surprise inside! *Edited...go here to see all of the details on the cake! For the party favors I picked up the green (her favorite color) glitter chinese take-out boxes from Michael's for the girls to fill up with their candy from the pinata. I also bought some gold stars from Dollar tree (5 per pk. 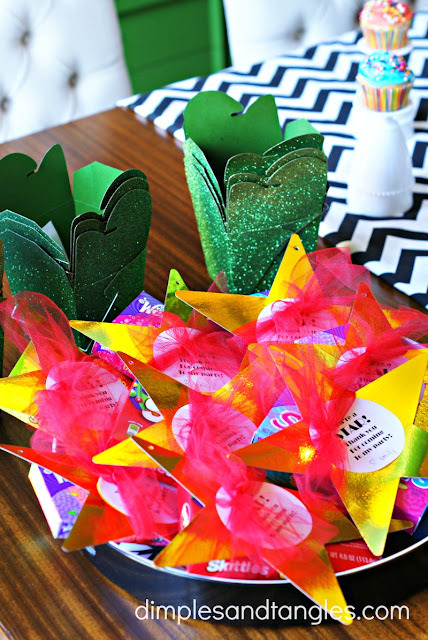 ), printed off a "You're a STAR-Thanks for Coming" message and attached it to the center, and tied it with tulle around movie theater candy boxes. After the party guests left, the action continued with Aunt Sarah...we pulled out the old Nintendo 64 and the Mario Kart challenge was on! See you next time with all of the details on the cake! What a great birthday party!! You are such a fun mom! I think I might have to borrow this idea of the movie theme for my two May birthdays. So fun. And I haven't been on Instagram much because my phone is broken and not holding a charge, so I can't wait to hear more about this beautiful cake!! What a great party! 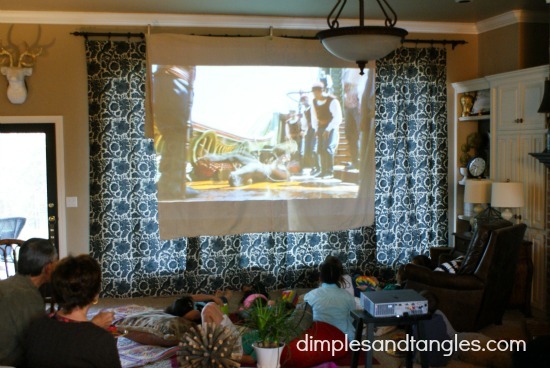 I have been looking for a projector on craigslist, I want to throw pool movie parties this summer. I found a project to create a screen stand using PVC pipe...of course Pinterest makes everything seem so simple! It looks like so much fun. I really like the idea of the movie night with the party. 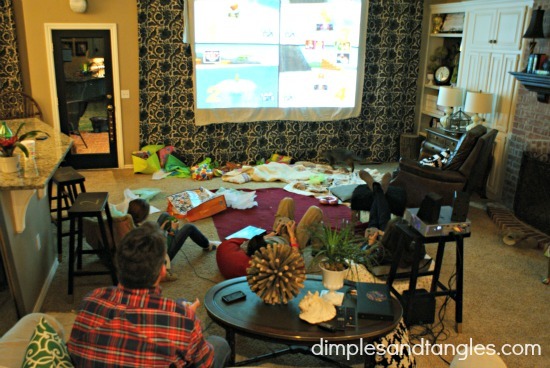 My husband wants one of those projectors so bad. He wants to get rid of our tv and just project onto a white wall...the guy can dream. What fun! 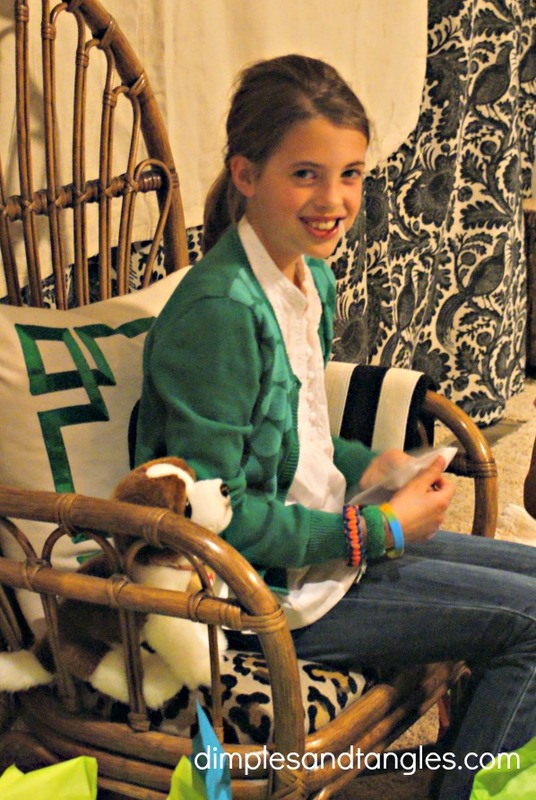 She is soooo pretty ~ like her Mom I believe. Looks like she had a great time and that's what matters. I have never understood the parties, especially for little ones, that seem to cost a bundle. I tend to think those parties are to impress others. Love all the bright colors you used! The movie night is a great idea. Can't wait to see the cake details. Looks like so much fun!! Cannot believe our babies are 10!! I agree with keeping it simple and on the cheap! That's how we do it around here! The party should be about the people not how much money you spend :) Great job as always!! 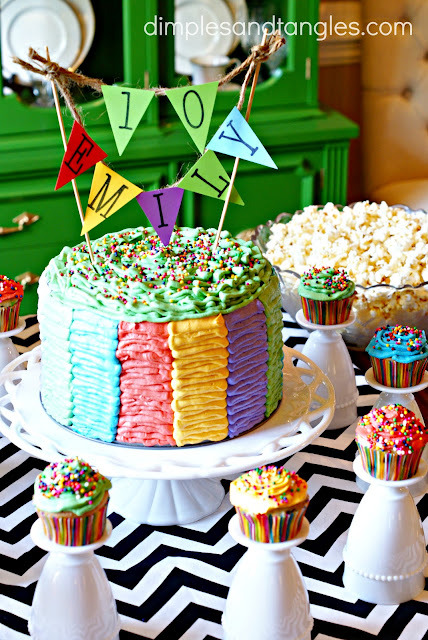 So colorful, fun and pretty! Love it! And like I said before your daughter is beautiful. 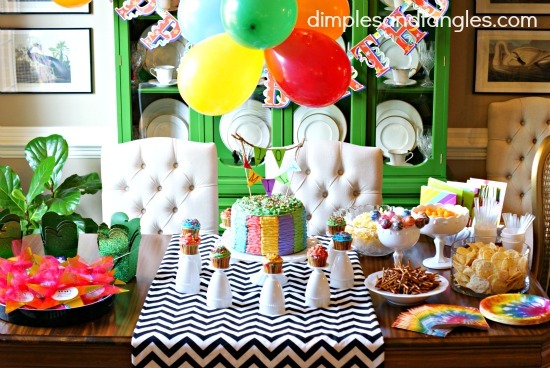 what a fun party, so cute! So, so fun! I love it! I wanted to do a backyard movie for my son last year, but couldn't get our hands on a projector. 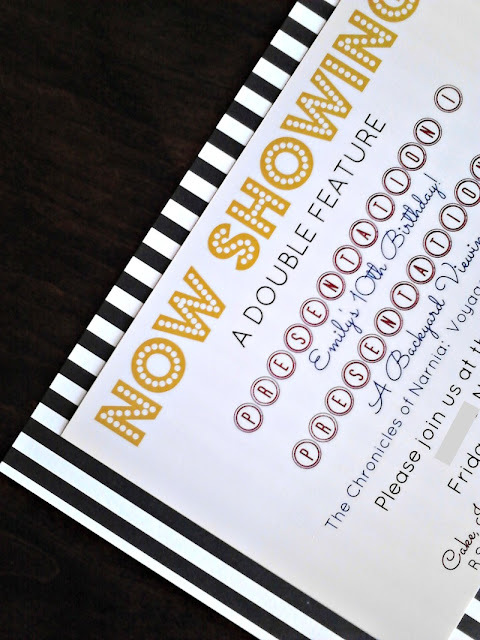 What a great party, every detail!